Golda Meir, Hannah Senesh, Helena Rubinstein, Ruth from the Bible, Joan Rivers, Justice Ruth Bader Ginsburg, Barbra Streisand, Gal Gadot… history overflows with strong Jewish female role models and inspirational trailblazers. 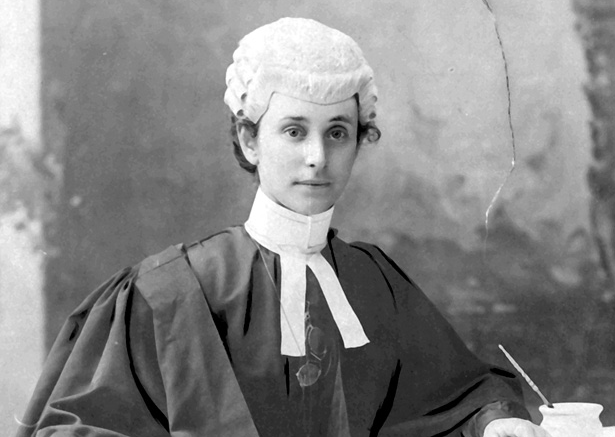 One such vanguard was from New Zealand – Ethel Benjamin, the country’s first female to graduate in law, the southern hemisphere’s first woman to be admitted as a barrister and solicitor, and reportedly the first woman in the British Empire to appear as counsel in court. Born in 1875 to an orthodox Jewish Dunedin family, Ethel was the oldest of seven children. She was a student at Otago Girls’ High School, where she excelled, before beginning her law studies in 1893 at the University of Otago. She was the first woman admitted to the university’s law school, and indeed that law school was the first in Australasia to admit women. Ethel faced many obstacles during her studies, including being denied permission to use the university library. (Ironically, since Suffrage Centennial Year 1993, a cul de sac across the road from the library, has been named Ethel Benjamin Place.) However, she also excelled at university, and graduating in 1897, she gave the official reply on behalf of all graduands, the first speech made by a woman in an official capacity at the university. In the same year, she was admitted to the bar. The year before, the Female Law Practitioners Act was passed in order that she could qualify. It had been introduced amidst laughter and much opposition. One such opponent said that allowing women to enter the legal profession would have the effect of “… inducing a number of females to quite unsex themselves and to neglect the ordinary female duties”. Ethel began practising in Princes St, Dunedin, and her clients consisted primarily of wealthy married women with independent financial interests, as well as members of the small Dunedin Jewish community. She also acted for various hotels and licensed victuallers’ associations, which brought her criticism from Prohibitionists. She also undertook family law and adoption work. In 1899, she became honorary solicitor for the Dunedin branch of the New Zealand Society for the Protection of Women and Children, of which she was a founding member. In 1907 Ethel married Alfred De Costa in the synagogue on The Terrace in Wellington. They never had children. Practising in Wellington, she took offices adjacent to her husband’s in the Joseph Nathan and Company building at the corner of Grey and Featherston streets. Ethel and Alfred moved to England around 1910, where she may have practised law for a time, and they also lived in France and Italy. Predeceased by Alfred, Ethel died in England in 1943 in an accident. It is notable that the next woman to complete a law degree in New Zealand did not do so until 1911; only two women were admitted to the bar from 1910-1919. Ethel struggled to gain a foothold in the practice of law and dabbled in other businesses such as property speculation, hotel management, and banking. She was openly Jewish, but it is not possible to know whether that played a part in her struggle to build a practice. The Ethel Benjamin Prize for women was established in 1997 by the New Zealand Law Foundation, to mark the centenary of the admission of Ethel as New Zealand’s first woman barrister and solicitor. It is a merit based award to outstanding women scholars that supports post-graduate studies. Since inception, the Law Foundation has awarded this scholarship to over 30 outstanding New Zealand women law graduates, enabling them to study at some of the most prestigious universities in the world – Harvard, Oxford, Cambridge, Yale, New York, Columbia and Duke. Also since 1997, the Otago Women’s Law Society has presented the Annual New Zealand Law Foundation Ethel Benjamin Commemorative Addresses in honour of Ethel. The primary objectives of the address are to “honour and preserve the pioneering spirit possessed by Ethel Benjamin, to encourage education and achievement in the women of today, and to stimulate debate about issues affecting social justice and gender.” Past speakers have included Chief Justice Dame Sian Elias referred to above, as well as other outstanding female lawyers including the Chief Justice of Canada, judges of the High Court and Court of Appeal of New Zealand, the first Maori woman admitted to legal practice, the first judge of the High Court of Australia, a former Governor General of New Zealand, and the first female Prime Minister of New Zealand. Shalom.kiwi salutes Ethel Benjamin, a Jewish New Zealander and a pioneering feminist.